I should probably preface this post by saying that I am not a makeup artist. I don't know lots about it, but I thought I'd share what I use and like and I'd love to hear about what you love too. I am not a makeup snob. I try not to spend a lot and I switch up my products from time to time. Here's what I currently use on a "full makeup" day. Mineral Makeup from Costco. I used a pricier mineral powder for a short time, but couldn't bring myself to shell out for it again. 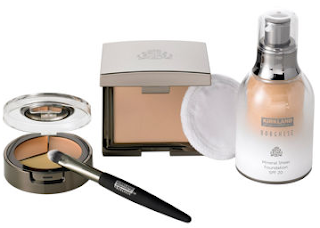 I use this concealer and powder that you can buy at Costco. I think it was about $30 for the whole thing. I mostly use the concealer and powder. I use this Covergirl Lash Blast mascara. It's inexpensive and it works. I never buy waterproof because I can't stand it not washing off well in the shower. For eyeshadow and blush I actually really like MaryKay, but I don't like having to order it. My sister has a sweet set up where she can get it at cost, but she lives far away and then has to ship it to me, etc. It's not super convenient, so I'll probably find something at Target I like soon. Any recommendations? For eyeliner I like this Neutrogena one. It stays on well enough but also comes off well enough when I wash my face. 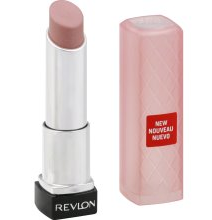 And if I'm feeling a little sassy I use this Revlon Colorburst lip butter in Berry Smoothie. (It's a little different than the color shown here.) I like it because it definitely gives me some color, but it doesn't dry out my lips (which mine always need help with). Okay, it's your turn. Do you have a product you love or recommend? My ears are open. I'd love to hear about it. Thanks for dropping in. I love the Ulta eyeshadows -they go on so smooth! I have a couple of rimmel blushes that I really like, and they are super cheap at Target or Walmart. I also love the BB cream by Garnier....I wear that instead of foundation most days, its very light and has just a hint of glimmer. Also loving Maybelline baby lips, they are like lip butter but with more of a creamy lip balm texture. I am a drug store costmetic junkie!! I don't wear blush, but i agree about the BB cream (finally bought myself one after trying& loving a sample months ago!) and baby lips! <3 it! Yeah, so I rechecked the database and not ALL of e.l.f. is low toxicity. Just fyi. Going to have to go back to ordering online I think! Using Coastal Classic Creations right now! I love Almay eyeshadows and their eyeliners! For some reason, I have never thought to check EWG's list for my makeup. Maybe I will from now on. I have used Stila eye shadows since I was 13, and I love them. I have purchased other brands here and there but always return to Stila. I love to apply them with a wet brush to get a smooth application. A dry brush gives a more subtle look. Kitten is their most popular shade (a very pretty shimmery neutral), but keep in mind that it breaks easily. I always end up having to transfer the pieces to a small container (like a pill box), though there are plenty of instructions on Pinterest to fix it. Since I use a wet brush with just a small amount of eye shadow, it lasts a really, really long time. I use Clinique mascara b/c I've found that it goes on smoothly and doesn't get gunky. On occasion, I try out supermarket mascaras and am disappointed every time. Other than that, I use the new Covergirl foundation (?) as my under-eye concealer. Been happy with that. When I want to shell out the big bucks, I turn to Bobbi Brown (ok, that happened only once and it was for my wedding). Check out Au Naturale also for very low reading on the EWG. Watching what you put on your body is as important as what you put in your body. www.aunaturaleglow.com. I would check out the sunscreen readings on the EWG as well. E.L.F. everything. Super inexpensive, but excellent quality. They do sell it at Target, but they have more stuff on their website, with most everything being $1. If you sign up for their email newsletter you can get some excellent deals too. Thanks for your recommendations; it's always nice to see what other people use. ELF is awesome. I have switched to most of their stuff. Target and KMart sell it. The one thing I don't like about ELF is the mascara. It tends to be too thick in the bottle and on the brush. Other than that, I love ELF eyelid primer. Cheap, but it does a good job at keeping my eye makeup in place all day, no eyelid creases. Also, Sally's has some eye shadows called Sally Girl that are inexpensive (under $1) if you ever want to try a color out before you spend on a more expensive brand. I love ELF as well. It is super cheap but works well. I use the Elf eyelid primer as well as my makeup stays on all day. You can get elf at target but they also have way more on their website. They always run fun deals too. Last time I ordered I spent $20 and got free shipping plus a mystery $20 bag. It had fun stuff in it plus a $5 gift card. I pretty much use all elf stuff except foundation. I love their powders but haven't found a foundation I love yet. But because they are so inexpensive I try new stuff all the time. I like their mascara but I only like the $3 mineral infused one. It doesn't clump at all but it is pretty light and thin. Good luck!! Such a fun post and all the comments are like little gems! I was looking for a new eye liner so I think I'll give yours a whirl! For a cheaper product I have been impressed with L'Oreal's BB Cream and Vanicream for facewash and lotion. That is my fav mascara too. I also love Neutrogena foundation. Right now my favorite beauty product is what I'm using to clean my face. About 2 months ago I started using an equal mixture of EVOO and coconut oil at night. I dip a cotton ball in it and wipe my face with it. Then I wipe my face with a warm wash cloth. It's great at taking off eye makeup. My skin hasn't been dried out since I started this and it's really helped my breakouts. And at 33 I was ready to STOP having those! I am a WalMart makeup girl normally, but my sister-in-law had me try her MAC eyeliner once and I will never go back. It comes in a little pot and you use an angled brush to apply it. So much better than anything else I've tried, it's worth every penny! The wet'n'wild color icon shadow palettes are a nice price and super lovely! I am OBSESSED (that's in all caps because it's a big problem) with Sally Hansen Nail Polish Strips. I have a "secret" end cap at Target that has a lot of them when they go on clearance. I bought about eight packs the other day and at checkout I got a $2 off coupon and ran back to grab one more (making it $1.50). I've learned I can get to manicures out of a pack by turning it around after filing the end off and using it on another finger. I only use waterproof mascara when we go camping. That way it stays on the whole trip. One of my camping friends accused me of doing my make-up every day. I love Loreal Voluminous mascara- it washes off easy, and makes my lashes look long and thick. I use bare minerals powder and blush, but it is expensive. I tried the Costco one, and didn't think it worked as well. I 2nd L'Oreal Voluminous Mascara. I'm positive it has parabens and what not in it, but it does the job so well!!! I don't drink nor smoke, SOMEthing is gonna get me. My mascara of choice is L'Oreal's Voluminous...wonderful stuff...I don't try others, because I've been there, done that. My foundation, I'll switch from time to time but blush? Cat Cosmetics (http://www.catcosmetics.com/). I've used her blush for years. The Whiskers is perfect on everyone. Recently, I ventured out and bought her Orgazzle...and love it just as much as Whiskers. I love her bronzer...love her eye shadows... Sign up for her email newsletter...she has a great sale each month. Try her stuff, you will love it. i used to spend a small fortune on cosmetics but soon found that i was just as happy (if not happier) with the results i got with cosmetics i could find at target. i don't leave the house without "fixing my face", but i've got my routine down to just over five minutes (and that's mostly because it's pre-caffeine and usually around 6am). - maybelline great lash waterproof mascara. i use mary kay's eye makeup remover and it does an excellent job with the waterproof mascara. - lips vary depending on my mood or what i'm wearing. lately it's been mary kay's whipped berries, raisinberry, appleberry, and berry kiss. i'm also fond of using a lip balm (my mom made mine) and rimmel's cherry crush lip liner for a nice red lip.